Area 185 A. 0 R. 6 P.
William Glynn William Glynn Private dwelling with 2 rooms. Patrick Laffey Patrick Laffey Private dwelling with 2 rooms. Thomas O’Neill Thomas O’Neill Private dwelling with 2 rooms. John Gibsey John Gibsey Private dwelling with 2 rooms. Patrick Gibsey Patrick Gibsey Private dwelling with 2 rooms. John Sheridan John Sheridan Private dwelling with 2 rooms. Catherine Naughton Catherine Naughton Private dwelling with 2 rooms. John O’Malley John O’Malley Private dwelling with 2 rooms. 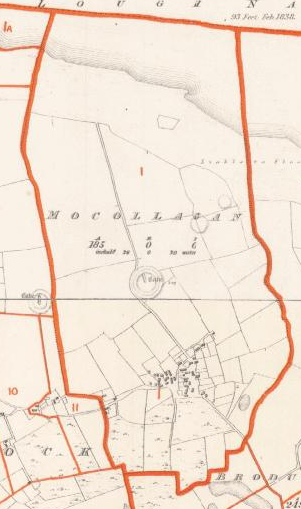 Magh Callagain , Callagan’s plain. E. and s. by the td. of Brodullagh South; and W. by Cahernabrock td. It contains 185a. Or. 6p., and includes 26a. Or. 20p, of water. It is the property of Lord Clanmorris. agents, Messrs Guiness and Co., Dublin. It is let to occupying tenants under leases for the duration of the proprietor’s life and 21 years, in farms of about 4 acres, at the yearly rent of from 14s. to 18s. per Irish acre. The tenants are all Catholics. The soil is light and sandy, with. limestone. There are 3 ancient forts in this td., in one of which is a cave.